HURLBURT FIELD, Fla. -- Slashing through Burmese jungles with Maj. Gen. Orde Wingate’s Chindits; hunkering down far above the DMZ in North Vietnam; infiltrating into Northern Iraq to ensure the success of a thousand-man airborne jump -- not the average day at the office for most weather forecasters. But those missions and many more have been business as usual since 1942 for the Air Force special operations weather teams assigned of the 10th Combat Weather Squadron here. The battle-trained meteorologists of special operations weather have been at the tip of the spear for more than 60 years. They have deploying with other special operators from every branch of the armed forces. 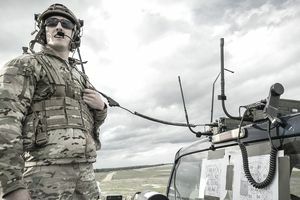 They provide combatant commanders with the weather data and analysis they need to plan and execute missions at the tactical, operational and strategic levels of war. Elite members of the Air Force Special Warfare program, special operations weathermen receive specialized training far beyond that of other meteorologists, squadron director of operations Maj. Don Shannon said. “Our guys have first gone through the normal weather training and served in an operational weather squadron before they can volunteer for SOWT,” he said. Weather team members are jump-qualified and may hold ratings as military freefall parachutists, air assault specialists, Rangers, combat diver qualifications and more, the major said. Some team members have received specialized training in military snow skiing, snowshoeing and avalanche forecasting to better align with their SOF counterparts’ mission, he said. “We know that when we put out a forecast, someone is going to use it downrange,” said Capt. Don Garrett, the squadron’s assistant director of operations. “We provide the real-time, eyes-on, ground truth about conditions that can critically impact the mission. Major Shannon agrees the people are what make the weather teams unique. In fact, there are very few SOWT operators in the Department of Defense. They are currently listed on the Global Military Force Policy low-density, high-demand asset list. There are roughly 100 SOWT operators in the Air Force, including 20 to 25 officers, Major Shannon said. Most are with the Hurlburt squadron. But others serve with AFSOC special tactics units in the United States and overseas, he said. Not only do the low numbers of billets make if difficult to enter into the SOWT field, the fitness standards and selection program is equally as challenging. In fact, the SOWT candidates have to ace the PAST that is the same events as the Air Force PJ and CCT: 2 x 25m underwater swim, a 500m swim, pushups, situps, pullups, and 1.5 mile timed run. They will also be required to ruck (carrying 50 pound backpacks) for timed events as well. NOTE: The PAST requirements are designed to test for a minimum fitness level for entry into the various training pipelines. Candidates should continue to train throughout their application process to exceed these minimums in order to enhance their chances of success as it is a highly competitive program. A “typical” SOWT mission was like that performed by Staff Sgt. Dave Mack. He infiltrated into Iraq with an Army special forces operational detachment alpha team during the early stages of Operation Iraqi Freedom. Tasked with collecting weather data, the team endured sandstorms that buried them in their sleeping bags. They survived 12 missile attacks, one which destroyed their humvee, and endured almost continuous small-arms attack. At one point, Sergeant Mack provided 36 continuous hours of weather observations so aircraft could evacuate seriously wounded Soldiers from Baghdad. He also performed security and weapons details with the other team members. Staff Sgt. Jody Ball, a four-year veteran of special operations weather, agrees. “The combination of the people and the mission is what makes this job so great,” he said. “I work with Rangers, (Army) special forces, (pararescue jumpers), combat controllers -- it’s an elite group.